Camfil’s monitoring coincided with the worst air pollution episode so far this year. On Wednesday 18 March, Camfil recorded a daily mean for fine particles (PM2.5) in outdoor air of 346 micrograms per cubic metre (ug/m3) which is nearly 14 times the World Health Organisation (WHO) guideline. They also recorded between 300,000,000 and 400,000,000 particles per cubic metre in outdoor air with a diameter between 0.3 microns (um) and 0.5 um. See note 2 below for details of these air filters. In other findings, magnification at 10,000 times revealed combustion particles, corrosion or iron rich particles, different types of minerals (e.g. sands) and gypsum, cement or similar in outdoor air. Please note that a building may have mechanical ventilation, air conditioning (and/or heating) and air filtration or any combination or none of these. Standalone air filters can also be used in an office or room. “It was a marvellous coincidence that Camfil’s international testing team was in London during the worst air pollution episode so far this year. They showed that air pollution in London that week was like a bad day in Beijing or Delhi. 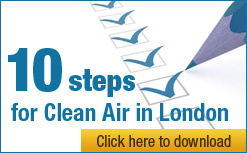 “These results show that you can protect yourself from even the worst air pollution in London. Camfil’s low energy air filters reduced outdoor air pollution by up to 93% in an office with mechanical ventilation. “Ventilation, air conditioning or heating do not filter the air. We are similarly concerned that synthetic media air filters quickly lose their filtration efficiency as electrostatic charge in the media is lost. Ultra violet light does little or nothing to reduce particle or gas levels and neutralises other bio-particle pollutants only when close to them. We need air filters in London that will reduce harmful particles and gases. “With London’s air being heavily polluted, CAL recommends the use of three stage air filtration to comply with BS:EN 13779 (2007) and achieve the highest indoor air quality. CAL also recommends the use of ‘pre-filters’ to prolong the life of air filters, especially carbon filters, since dust can block pores in the carbon and affect the removal efficiency of harmful gases. The most energy efficient solution is likely to combine a higher filter class in incoming air and one or more standalone air cleaners (preferably including a carbon filter) within the office or room to remove the particles and emissions generated indoors e.g. volatile organic compounds. Most of the desired improvement can be achieved within about 30 minutes. “If your office has mechanical ventilation, ask the facilities management team whether it uses regularly maintained air filters complying with British and European standard BS:EN 13779 (2007). If the office doesn’t, please consider using standalone air cleaners. “Previous investigations by CAL have shown that few local authorities know if their schools use air filters to protect children and that air quality in hospitals may be no better than warehouses with just four of 10 hospital groups in London complying with BS:EN 13779 (2007). (i) City-Flo XL is a low pressure drop, two in one combined particle and molecular bag filter for the removal of various particles and gases in urban environments. (ii) Hi-Flo XLT series has been designed to meet today’s market demands for low-energy HVAC systems and sets a brand-new standard for energy-efficient removal of particles from ventilation air. (iii) CityCarb filter combines an effective carbon filter with a high-efficiency particle filter in the space of a compact filter. It is an optimum solution for non-specific odour control and enhanced indoor air quality in comfort ventilation applications. (iv) City M standalone air purifier equipped with particulate and molecular filters delivers a healthier indoor environment by removing dust, contaminants and harmful particles in department stores, offices, schools, hospitals and homes.